Of course the media and sellers of electric waffle irons and waffle mix also play a role in supporting the Waffle Day dialect mix-up, and this time of year food magazines publish articles about the best waffle irons. Swedes started making waffles in square-shaped irons over an open fire and the heart-shaped form that is common today appeared at the end of the 19th century. The simplest waffles were made of just flour and water but when it was time for a celebration cream, eggs, butter and sugar were added. In the spring around the time of Marie bebådelsedag the hens started to lay eggs again so it was a time to celebrate. 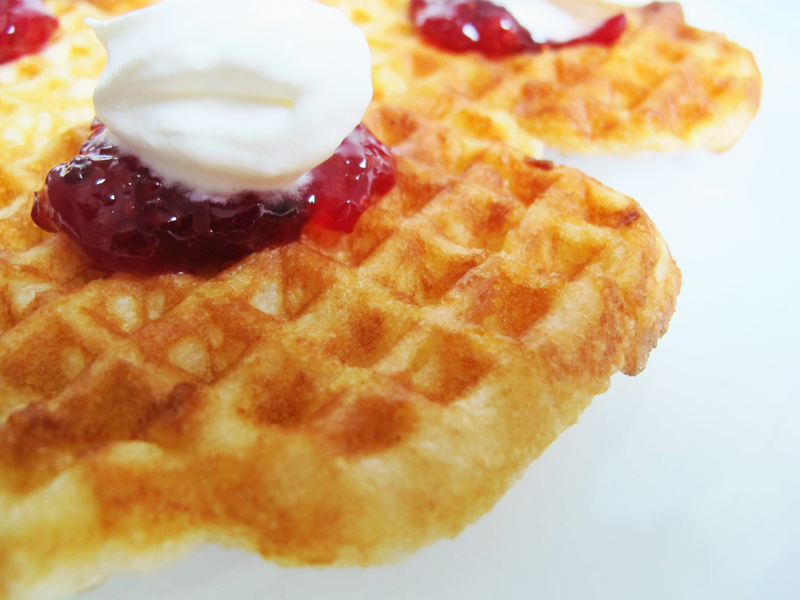 Around 1900 it became common to eat waffles with jam and cream. On a side note with no waffle connections, historically this was also a day in southern Sweden that marked the return of the cranes and daylight. It was known as the time when you could stop using candles indoors and some urban workshops would celebrate with a little party in the evening. Now back to the waffles…. 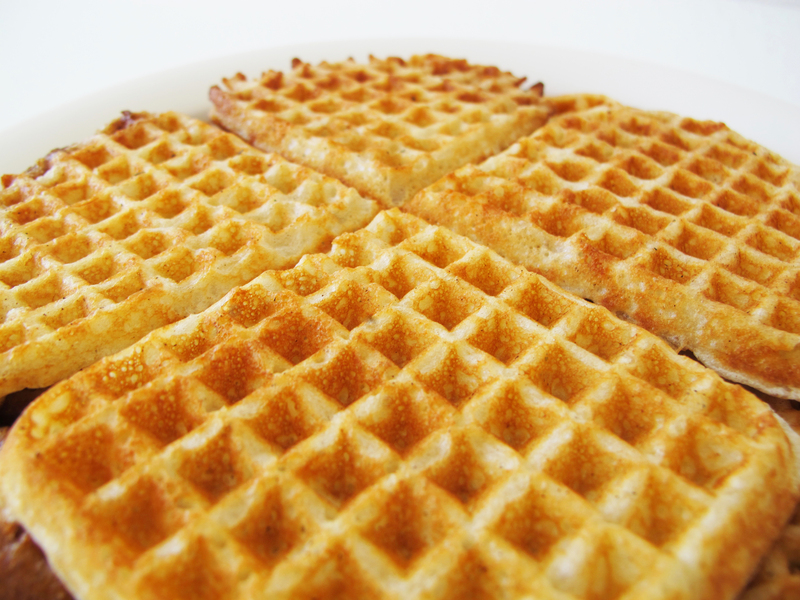 There are different versions of waffles but the ones associated with Waffle Day are cream-based (frasvåfflor). I really like the egg-based version too (äggvåfflor) and I have a gluten-free recipe which is really tasty. You’ll find all three recipes below. Swedish waffles are thinner than American waffles and should be very crisp and golden on both sides. The other big difference is that Swedish waffles are a dessert, NOT breakfast. You need a special waffle iron to make true Swedish waffles, and unfortunately not all waffle irons are created equal. I didn’t find a retailer to the American market, but if you are looking for a Swedish waffle iron try to find one with a pilot light that will indicate when the waffles are finished (peeking too early can make them stick) and preferably 1400-1600 watts so it gets nice and hot for a crispy end product. A double iron is a luxury since the waffles are best eaten right when they are made and being able to make two at a time is a real advantage. The traditional accompaniment is jam and whipped cream but you can also make savory waffles incorporating fresh herbs into the batter and topping them with something like cold-smoked salmon, crème fraîche, and caviar. My mother-in-law gave me one of her old irons that gets scorching hot producing crispy, golden waffles. They are divine. So if you can get your hands on a Swedish waffle iron and want to give these a try, I don’t think you’ll be disappointed. Especially if you break out some of your homemade jam from this past season (we have been loving the strawberry red currant jam on our waffles). And don’t worry about it if Waffle Day has already passed. These are enjoyed in homes throughout Sweden year-round on ordinary days as well as special occasions. 1. Whisk together the flour and water in a medium-sized bowl. 2. Whip the cream until stiff and fold it into the flour and water mixture until fully incorporated. 3. Heat the waffle iron and brush it with melted butter. Ladle 1/3-1/2 cup of batter into the iron and cook until golden brown. Serve immediately with fresh berries or jam and whipped cream. 1. Melt the butter and let it cool a bit. 2. Whisk the flour, salt, baking powder and half of the milk until smooth. Add the rest of the milk, eggs, and melted butter and whisk until smooth. 1. Whisk the eggs together with a little bit of the milk and the oil. 2. Blend the gluten-free flour, baking powder, and salt in a medium bowl. Add the egg mixture and remaining milk, whisking until smooth. 3. Heat the waffle iron and brush it with melted butter. Ladle 1/3-1/2 cup of batter into the iron and cook until golden brown (stir the batter periodically to keep the flour from separating). Serve immediately with fresh berries or jam and whipped cream. I absolutely love Vår Kok Bok. It’s so reliable and covers the classics so well. I am having so much fun getting more and more into Swedish cuisine and culture with this blog. I never even knew about Waffle Day until this year. What a shame…3 years of lost waffle opportunities. But I’ll make up for it now that I’ve got the recipes down and the vintage waffle iron is spiffed up. I was so happy to see your post this morning. Just last night I was on you site looking to see if there might be an older post with a waffle recipe. I’ll be making these tonight! Thank you. I had such good intentions to get it posted two days ago, but it just didn’t happen. I’m glad I wasn’t too late so you can still enjoy them this evening. We really enjoyed ours with some strawberry red currant jam. Yum! Happy Waffle Day! I love waffles. In Madrid we call them “Gofres” and you can find some tiny shops (take aways) selling it. I will share this recipe specially the one without gluten. Thanks for it. You’re welcome. I really like the gluten free version. You really can’t tell it’s gluten free. I use a corn flour based mix you can buy here in Sweden. Now I just have to stop myself from making these every day because I am burning through jam and cream like crazy and at this rate I’ll be out shopping for new jeans soon. I tried the egg waffles this year and they were delicious!